Digital download music sales continued to rise in the UK in 2011, but not by enough to prevent an overall decline in album sales, according to the BPI. The music industry body said that 26.6 million downloaded albums were sold, a 24% rise on the previous year. However, CD album sales fell by 13% to 86.2 million discs. Overall, 6% fewer albums were sold than in 2010. The BPI blamed the decline on piracy and accused the government of taking too long to tackle the problem. Digital downloads have recorded rapid growth over recent years. In 2007, only 6.2 million albums were bought as files over the internet according to The Official Charts Company. The year 2011's tally was more than four times that amount. 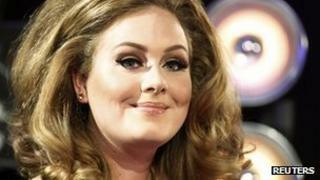 Fifteen albums sold more than 100,000 digital copies, with Adele's 21 proving the most popular. However, shoppers still showed a preference for CDs, buying more than three times the number of albums on disc than downloads. The BPI said that "physical ownership" still played an important role, but said "a backdrop of chronic piracy" posed risks to the music industry. "While other countries take positive steps to protect their creative sector, our government is taking too long to act on piracy, while weakening copyright to the benefit of the US tech giants," said Geoff Taylor, the BPI's chief executive. "The UK has already fallen behind Germany as a music market. Unless decisive action is taken in 2012, investment in music could fall again - a creative crunch that will destroy jobs." The government is pursuing a plan that would involve rights holders sending lists of internet addresses suspected of illegal downloads to internet service providers (ISPs). The ISPs would then send a letter to suspected account holders, saying that their account had been identified as being used to download copyright infringing material. They would offer advice on how to prevent such illegal activity, but would not make demands for money or threaten disconnection. By contrast, France has passed a law that allows pirates to be blocked from the net from one year after three infringements. A spokesman for the UK Department for Culture Media and Sport said: "We will continue to work with industry on how they can better tackle online piracy but this is not an issue that ISPs or rights holders alone can deal with". "All elements of the internet industry - payment companies, advertisers, search engines, ISPs and rights holders - need to play their part in tackling unlawful activity online." While piracy may be partly to blame for the drop in album sales, the data also suggests changing buying habits. Sales of singles rose for the fourth successive year to 177.9 million copies, versus 86.6 million in 2007. Downloaded copies accounted for 98% of the sales. Each of the top 20 singles of the year sold more than 500,000 copies. One industry watcher said this underlined the fact that shoppers had become more choosy. "People now buy the individual songs they like rather than buying the whole album because they like a single," said Philip Buxton, an independent digital media consultant. "So they might buy the single and then use services like Spotify and Lastfm to listen to the other tracks and are then much more selective about what they purchase. "The implication for the record industry is that they need to embrace this new model rather than fight it."